And for the A85, the extention is well advanced now. But it's a over 100km new highway so, the whole highway will only be opened around 2015, with some gradual little openning stretches before 2015. This is a plan of the new highway on a PDF with explainations about each parts. Some Stretches are now open, without the purple and red ones. 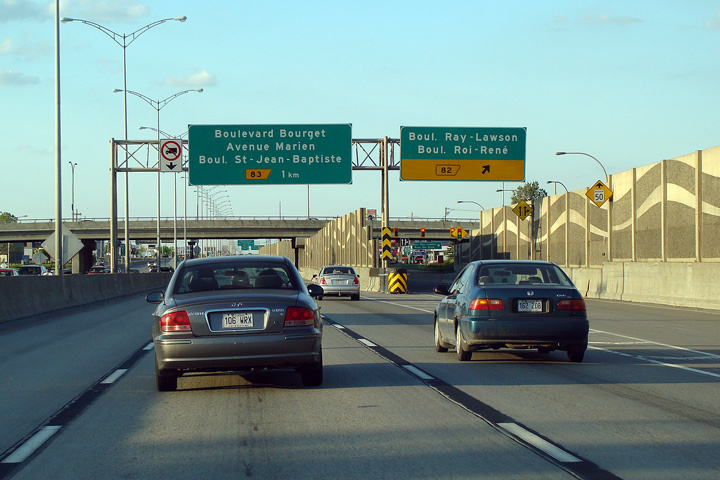 According to Transport Quebec, A-85 should be fully completed by the end of next year. What I would like to know is if they will ever consider building a bridge for Route 138 over the Saugauney River? Thanks Franks and Hellfighter, just too bad it wont be ready for my trip to NB next year. I don't think so, and anyways they did some interviews and they clearly said that the A85 will fully opened in 2015, and anyways here in Quebec , highways projects are always late ! And for the Saguenay river they did some plans and videos about it, but I don't think it is serious for now. it's a over 1 billion of $ for what ? around 100 000 peoples. I don't say that this is couldnt be good, for the Région côte-Nord it should be, but in general, our government is never spending too much money for a low-populated region, you just can see how they're doing with Super-2 highways around here about that. This thread brings back soooo many memories of driving to Quebec from Maine (via Route 201) Last time we were there was 2004, but due to money and now having to get passports, it will be a long time before we can get back to Quebec. All our memories of traveling there has been awesome. People there are really cool, food is great and even though my french is near non-existant, I was able to get us around fairly easy. Funny story while in Quebec. We were on A40 going for the day to Montreal. We got pulled over by the provincial police for going 124km in a 100km zone (even though most people were driving faster than us) I tried to play dumb American by saying I didn't understand metric speeds. He politely pointed out to me that on my speedometer it has mileage in MPH and KMH (damn!!) So I did get a ticket. When we got home I translated the ticket via Babelfish, paid it and sent it off. (Ticket was entirely in french) A few months later I get a letter from the police there stating that THEY had overfined me and included a check for the difference of $15 Canadian!! I did cash the check, but should have kept it!! BTW: The policeman was VERY polite,and I even helped him with a few english words, which he appreciated!! I got pulled over for the exact same speed, while being passed too. Some local (municipal) authorities have bilingual tickets, but not the Sûreté du Québec. What I would like to know is if they will ever consider building a bridge for Route 138 over the Saugauney River? And for the Saguenay river they did some plans and videos about it, but I don't think it is serious for now. it's a over 1 billion of $ for what ? around 100 000 peoples. I don't say that this is couldnt be good, for the Région côte-Nord it should be, but in general, our government is never spending too much money for a low-populated region, you just can see how they're doing with Super-2 highways around here about that. I did the Saguenay river crossing earlier this month, on my way back from Labrador. Convenient and free ferry service, with two vessels both covering the ferry route, very short wait and crossing times. I'm not sure a bridge would be useful, unless ice or weather closes the ferry during part of the year. Otherwise, the best reason for a bridge would be just dollars-and-cents, if the cost of building and maintaining a bridge would be less than the operating costs of the ferries. Does anybody know, when is the A-35 extension supposed to open? End 2013 to Saint-Sébastien, just north of Venise-en-Québec, then full completion in 2017. I was looking at Google Maps today along A-15 north of pont Champlain, and I noticed that there is a set of traffic signals just north of pont Iles-des-Soeurs that seem to regulate where busses enter traffic during the reversible lane hours. Do they really stop freeway traffic to let busses in the reversible lane? I've honestly never seen those operate. But I tend to avoid this area during rush hour. Yes they do, from 3:30 PM to 7:30 PM and on A-15 north only. Last summer, heavy jams formed from Pelletier boulevard on A-10 and Rome boulevard on A-15, Mercier bridge closure forced vehicles heading towards Montréal to use Champlain. This added an awful 45-60 min to the bridge crossing time, when entering the island on a PM rush hour. I have recently begun collecting old road maps from Québec. My latest purchase is a 1964 atlas where the Autoroute network is just starting to blossom. This is my second map from that era and I am noticing that Québec had a fairly extensive dual highway network constructed in advance of the Autoroute network. For example, almost all of what was then Hwy 9 (now R-116 and A-20) was four laned between the South Shore of Montreal and Quebec City, however everything west of Saint-Hyacinthe followed what is today's Route 116. Also, I noticed that what has become today's Metropolitaine began from then Hwy 2 following what is now A-520 to get to what is now A-40. 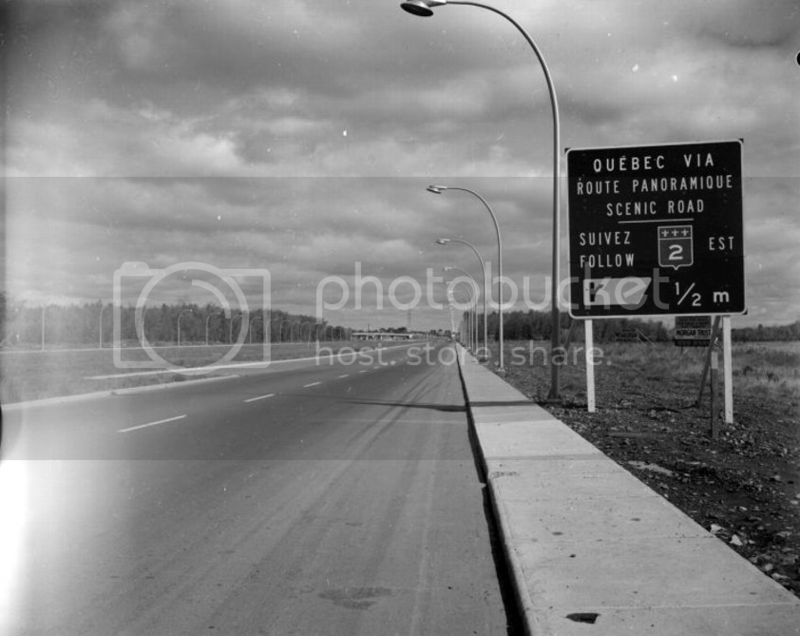 Does anybody know, was Metropolitaine first an at-grade divided highway that was later upgraded to an expressway standard during the Autoroute era? It would seem that way. Also, I noticed that what has become today's Metropolitaine began from then Hwy 2 following what is now A-520 to get to what is now A-40. 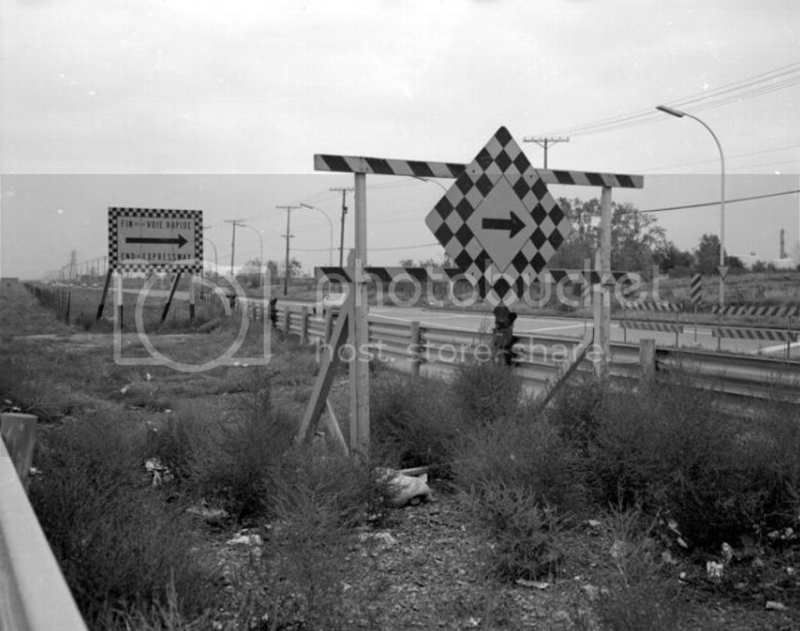 Does anybody know, was Metropolitaine first an at-grade divided highway that was later upgraded to an expressway standard during the Autoroute era? It would seem that way. Yes, indeed. Autoroute Côte-de-Liesse and autoroute Métropolitaine follow old rural roads. You can even observe some remnants of it. Boulevard Métropolitain (A-40), approaching boulevard Henri-Bourassa, looking east. Picture by Gabor Szilasi (1970), Archives Nationales du Québec. Boulevard Métropolitain (A-40), east of boulevard du Roi-René, looking east. Boulevard Métropolitain (A-40), east of boulevard du Roi-René, looking west. 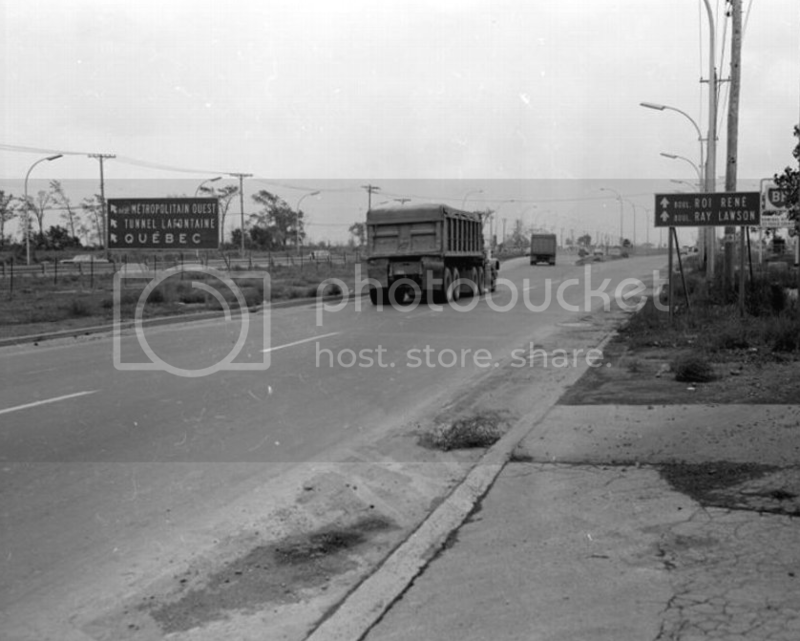 End of Boulevard Métropolitain/Beginning of Autoroute de la Rive-Nord (now Félix-Leclerc) (A-40), near boulevard Henri-Bourassa, looking east. Picture by Henri Rémillard (1970), Archives Nationales du Québec. Not as cool as the historical photos that precede this post, however, this links to a photolog of Autoroute 15 through Montreal. 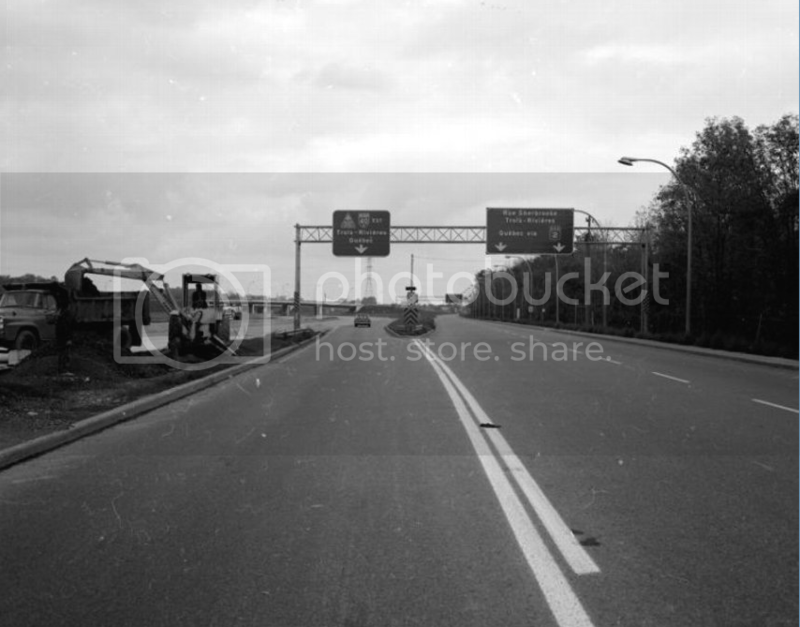 Great Youtube clip of the Ville Marie Autoroute through Downtown Montreal. It looks like many of the tiles on the walls of the tunnel are in need of replacement. You are indeed very correct! The Can$4 billion price tag is an enormous cost for repairs. The 4G$ program cited in the article is to inspect and maintain every structure under MTQ jurisdiction. Not just Ville-Marie tunnel. The first "real" storm of this unsnowy winter revealed to be fatal for driver in a spectacular accident. 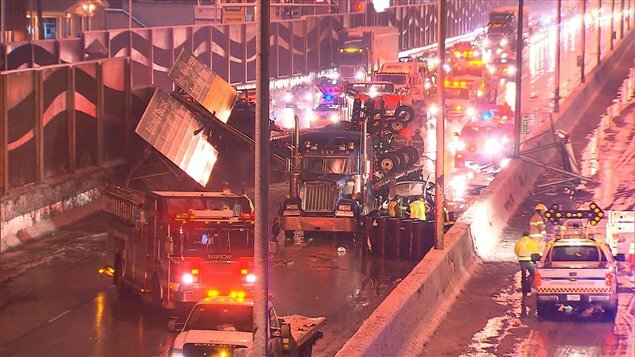 Highway 40 eastbound remains closed in Montreal's Anjou sector after a fatal accident late Friday night, during the first major snowfall to hit Quebec in weeks. A 49-year-old man was killed in his car after it was struck by debris from a transport truck collision near the Roi-René exit. The transport truck crashed into several safety barrels on the side of the road before it hit a large metal road sign structure hanging overhead, which fell on the car. A second transport truck was also struck by the debris, but the driver escaped uninjured. Authorities shut the eastbound lanes to finish their investigation on Saturday. Eastbound drivers have to exit at Ray-Lawson, police said.Only one westbound lane will be open, until inspectors finish their investigation. The accident is one of two deadly road collisions reported during Quebec's first major snowfall this month. Bad luck for the driver of the car. The first semi is said to have hit those "trashcans" full of sand, then the BGS gantry, at relatively high speed.